When is a ‘t’ silent in English? 1. -ften, -sten and -stle. 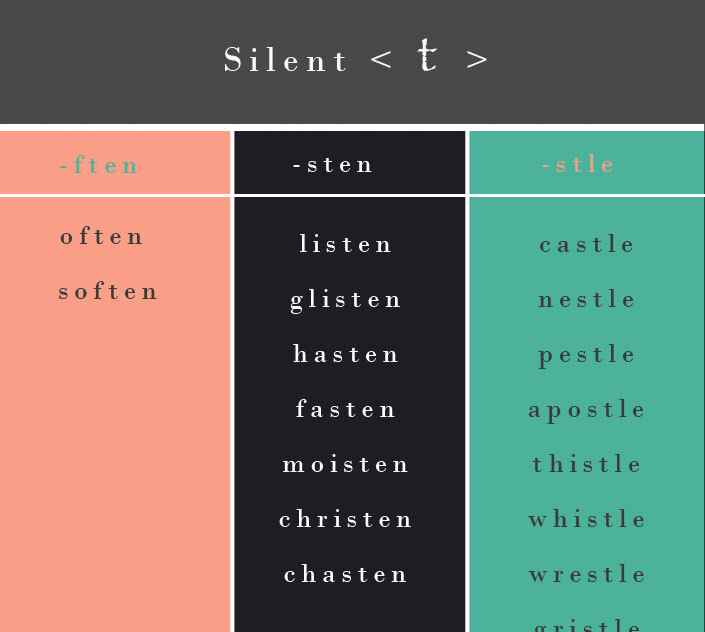 Common word spellings that (almost) always produce a silent < t >. 2. Fricative + < t > + consonant. There are other spellings where the < t > is not necessarily silent but can be silent in fast, connected speech. This can occur both within a word and between words. 3. French loanwords. In some French loanwords, we try to keep something of the original pronunciation, and this includes keeping the original silent < t >: ballet, gourmet, rapport, ricochet, penchant. 4. 3 consonant sounds at the end of a word = middle 't' is silent: acts, ducts, students.